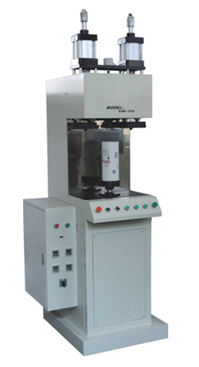 This machine is used for seaming the special spin-on filters which need inward seaming. 1.This specially designed machine has the function of gluing and seaming at the same time, and it is high efficiency. 2.The seaming molds moving action is automatically finished by cylinder set program. 3.Pressing the left-right buttons manually at the same time, so as for safe operation.